There's so much superhero content. What started as the odd blockbuster every few years has morphed into its own genre. Netflix previously teamed up with Marvel for (mainly) excellent street-level vigilante shows (Daredevil, Jessica Jones). Now they turn to one of the more esoteric comic imprints Dark Horse (home to Hellboy, Sin City and The Mask) as they adapt Gerard Way and Gabriel Bá's The Umbrella Academy. The Umbrella Academy is a murder mystery wrapped in an apocalyptic drama with a wild plot which takes in time travel, a talking chimp and the end of the world. The cast are perfectly suited to their enigmatic but diverse roles, each scared by their unusual upbringing. We also have Mary J Blige and Cameron Britton as a pair of ultra-violent assassins in cutesy animal masks. The Umbrella Academy might be a superhero show but it plays like film noir. Dark, brooding and shadowy, it's set in the modern world but styled like a 50s crime movie. Given that Way, who wrote the original comic, was lead singer in emo pop punks My Chemical Romance, it should come as no surprise that there's a rich layer of gothic weirdness shot through with pop culture and 80s references. Music is brilliantly utilised throughout, particularly in a scene which finds our leads dancing alone to Tiffany, and a bloody fight scene choreographed to They Might Be Giants' 'Istanbul (Not Constantinople)'. 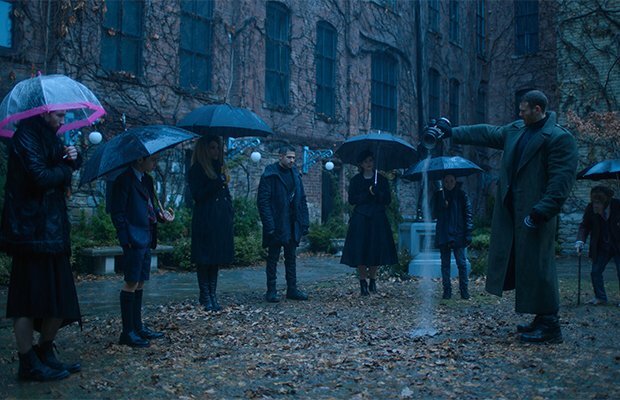 The Umbrella Academy offers something new and unique in an already crowded genre and is a rare example of an adaptation that might actually surpass the source material. Episodes watched: seven of ten. The Umbrella Academy is available on Netflix from Fri 15 Feb.